"He recibido mi pedido N' 627, esta en perfectas condiciones y conforme a..."
Sandstone beads olive carving format. The sandstone olive carving beads measuring about 8 mm x 12 mm. Holed and enfilades into strands about 40 cm, are ideal to create necklaces and bracelets. Each strand weighs about 30 grams and contains about 32 sandstone beads. Barrel carving beads of sandstone. Each barrel bead of sandstone measures 8 mm x 12 mm. They are holed and enfilades into strands about 40 cm. 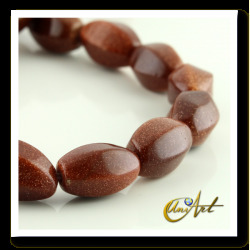 Each strand of barrel sandstone beads weighs about 28 grams and contains about 36 beads. 10 mm roud beads of sandstone. Sandstone beads are holed and enfilades into strands about 40 cm weighing about 50 grams. Strands of sandstone containing about 37 round beads size 10 mm in diameter. 8 mm Roud beads of sandston. Holed and enfilades round beads sandstone 8mm size. Each sandstone strands measuring about 40 cm long weighing around 35 grams. Each stand contains 65 sandstone 8mm round beads. Sandstone is the ideal for make necklaces and bracelets. 6mm Sandstone round beads. Holed sandstone round beads size 6 mm to assemble jewelry. Sandstone round beads are enfilades into strands about 40 cm long. Each strand weighs around 20 grams and contains 65 sandstone beads. 4mm sandstone round beads. 4 mm sandstone roud beads are holed and enfilades into strands about 40 cm. Ideal for making necklaces and bracelets. 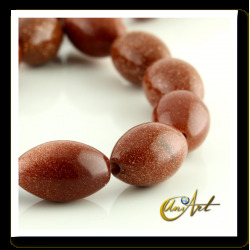 Each strand of sandstone beads weighs around 10 grams and contains 98 beads.